The European Union and Japan will sign a sweeping trade deal Tuesday in Tokyo. The new deal will eliminate 99 percent of tariffs on Japanese products to the EU, from automobiles to electronics, as well as agricultural exports from European Union countries to Japan, including cheese, wine and pork. EU chemical exports to Japan are also expected to surge under the new pact.The deal was finalized late last year after four years of talks, and is expected to formally take effect in 2019. 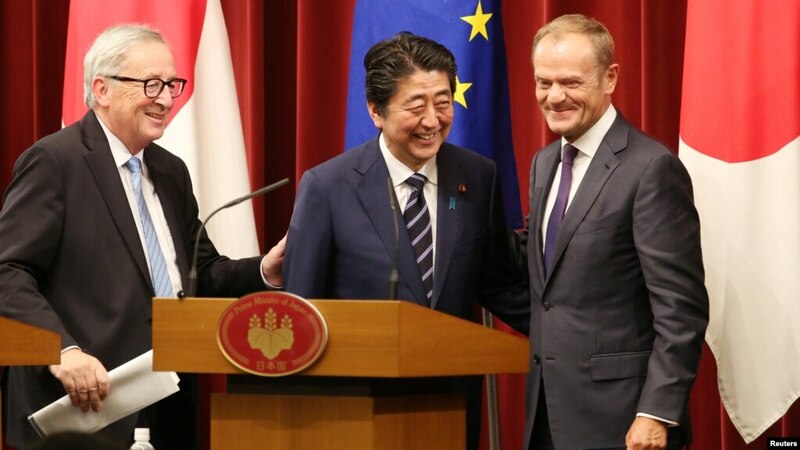 Japanese Prime Minister Shinzo Abe will sign the deal during a meeting with European Council President Donald Tusk and European Commission President Jean-Claude Junker. Abe was to have signed the deal last week during a planned trip to Brussels, but was forced to cancel the trip to deal with massive landslides in southwestern Japan that killed over 200 people.